Your car key is your ticket to being mobile. The key starts the engine of the vehicle that gets you from place to place. So, when that key is lost or fails to work properly, you will need a car key replacement for your vehicle. Know who to call to get the key replaced and back on the road again in no time. Car keys nowadays are a lot more complicated than those that were used even as soon as five years ago. Keys used to be made of metal that required a special machine to physically cut grooves to match your car’s ignition. Almost every car manufacturer today installs ignition switches and keys that uses electronic signals to start the vehicle. Whether, there is a chip on an electronic key fob or the entire key mechanism is electronic, only keys with chips that send the correct code is successful in starting up the engine. Car ignition keys are becoming more technologically advanced making car key replacement a more complicated procedure. 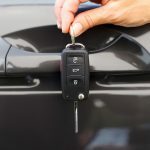 It is no longer an easy mechanical matter of cutting grooves into a metal key, but that doesn’t mean you cannot get a fast car key replacement when you need one. You may find yourself in many different circumstances that would require a need for a car key replacement. The key has broken off inside the ignition (in which case the key must first be retracted before a replacement key can be made). Whatever reason you have for needing a car key replacement, you know you can always rely on the services of a qualified car locksmith to provide you with a new working key. Many mobile automobile locksmiths will come to you to replace and even program electronic or transponder keys. It is important to aim for quality when you need a car key replacement. That is why your best bet is to contact an automobile locksmith who knows how to replace any model of car key and is able to program an electronic key on the spot without charging you car dealership prices for the service. When you call, the locksmith will need to ask your vehicle VIN number. This is important as it will reveal the make and model of the car which is the key to finding out all of the necessary information needed for replacing the car key properly, Since, you are most likely dealing with an electronic program code, you will want to make sure the new key syncs properly to your specific vehicle. Take the stress, worry, and waiting time out of the entire process, and call a qualified Bellevue locksmith today for all of your fast, safe, and affordable car key replacement needs – A mobile automobile locksmith is able to come to you, stocked with the needed tools and skilled with the needed know-how to replace your car keys on the spot. Don’t hesitate to call today.